Members have been meeting for two years. 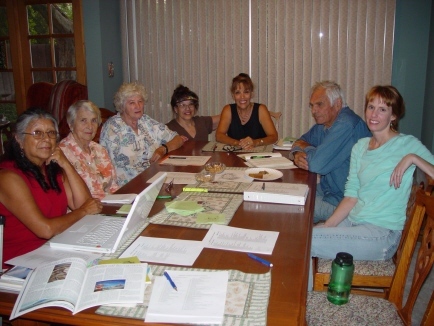 From left Helena Quintana, Evelyn Zinn, Stacy Vellas, Pat Bucher, Pat King, Jay von Werlhof, and Carrie Simmons. Jay von Werlhof and Preston J. Arrow-weed hard at work at an Exhibit Committee meeting. Jay von Werlhof is a well-known archaeologist, author, artist and we are privledged to have him actively working on our exhibits. 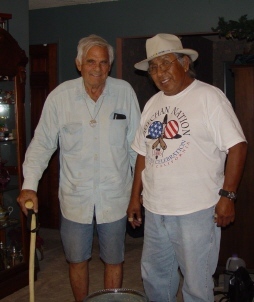 Preston J. Arrow-weed is a Quechan elder, storyteller, writer, director, producer, actor, and speaker. He is a consultant for the IVC Desert Museum Exhibits. 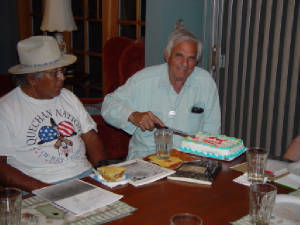 We celebrated Mr. Jay von Werlhof's birthday at one of our committee meetings with an ice cream cake. Jay is cutting his birthday cake. Are you interested in exhibits? Just want to start a correspondence? Please get in touch! LARRY SCRIBNER, Calipat State Prison Warden, met with Matt Dessert, Pat King, Jay von Werlhof, and Pat Bucher on August 21, 2007, to discuss plans for prison artists participation in exhibits. Daniel Marquez, Arts Facilitator, will be coordinating this project with Pat King.